The astronauts also plan to field questions from reporters in round-robin interviews starting at 2:43 p.m. EST (GMT-5). A Mission Management Team briefing is planned for 4 p.m. to review ongoing analysis of the shuttle's heat shield and other systems. But the crew was told early Sunday that a focused inspection of the heat shield will not be required later in the week, indicating no major problems have been found. "Great news for you," astronaut Stephen Robinson radioed from mission control. "No focused inspection for flight day six. That means we will replan flight day six per the way we had intended preflight, which is further outfit of the (Permanent Multipurpose Module) and maybe a little transferring, too." "Outstanding news, Steve," shuttle commander Steven Lindsey replied. The crew's focus Sunday was on equipment transfers, repair work, robot arm activity and spacewalk preparations. "We're going to be transferring some of the supplies from the shuttle middeck to the space station, putting everything away where it goes," said space station Flight Director Chris Edelen. "Also, there's a big operation (by the station crew) to remove a stuck (water) valve in the Columbus module, the European module. "Discovery has brought up a jumper to replace that valve so (it) can be removed and brought back to Earth for inspection and eventual repair. To do that requires a rack to be rotated in Columbus and it's going to take several hours of close coordination between the crew on board as well as the European control center outside Munich." Overnight, ground controllers moved the station's robot arm from a work site on the lab's solar power truss back to the Earth-facing side of the forward Harmony module. The arm was used Saturday to move a massive external storage platform from the shuttle to a mounting point on the underside of the truss. "They lifted that out of the shuttle payload bay using the station's robotic arm," Edelen said. 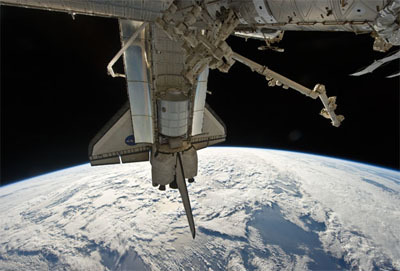 "They handed it off to the shuttle's robotic arm, repositioned the station arm so it could reach way out on the far starboard side of the station's truss, the external structure, and then they bolted ELC-4 to its permanent position where it will provide a mounting platform for external spares." Express Logistics Carrier No. 4 was launched with a spare set of folding radiator panels for the station's ammonia cooling system. Two other items -- a cooling system rotary coupler and a box of spare electronic switching units -- will be moved to ELC-4 later. They were brought to the station by a Japanese HTV cargo ship. But the radiator panels, which weigh 2,475 pounds and are 11 feet wide, required the shuttle. "The space station has two large radiator wings, each made up of three separate panels, and inside these panels are tubes where liquid ammonia flows," Edelen said. "And that flows throughout the outside of the space station, it's used to cool all the electronics on space station, and it interfaces with heat exchangers for the internal module cooling as well. So a very critical part. "If we take a micrometeoroid or orbital debris hit in one of those six panels, the ammonia could leak out. So now we have a spare radiator panel that we can install by spacewalk if that ever happens. It's good to have the spare parts on station. This is a very big piece of spare equipment and it can only fit on the space shuttle." The station's robot arm was moved back to the Harmony module overnight for use today lifting the shuttle's heat shield inspection boom out of Discovery's payload bay. That will clear the way for removing a final U.S. module, called the Permanent Multipurpose Module, or PMM, from the cargo bay Tuesday. The new module, loaded with supplies, science gear and an experimental humanoid robot called Robonaut, will be attached to the Earth-facing port of the station's central Unity module, providing additional long-term storage space. Late today, Drew and Bowen will move into the station's Quest airlock module for an overnight "campout," closing the hatch and lowering the pressure to 10.2 psi to help purge nitrogen from their bloodstreams, a routine protocol for U.S. station spacewalks to help prevent the bends. Work to mount ELC-4 got off to a late start Saturday and as a result, the Discovery astronauts were up later than originally planned. The shuttle crew was allowed to sleep an extra half hour, officially starting their day at 7:23 a.m. EST (GMT-5) with a recording of the Manhattan Transfer's "Java Jive" beamed up from mission control. "Good morning, Discovery, and a special good morning to you, Steve Lindsey," astronaut Michael Massimino radioed from Houston. "Good morning, Mike, and thanks to my family for that song," the shuttle commander replied. "Good to be back with you, looking forward to another good day."